Textile designer, prop maker, set design aficionado, you name it, Mariel Osborn has most definitely done it. The designer talks to us about creating a brand that stands out from the crowd, straddling numerous jobs, and how she is collaborating and sharing her work. 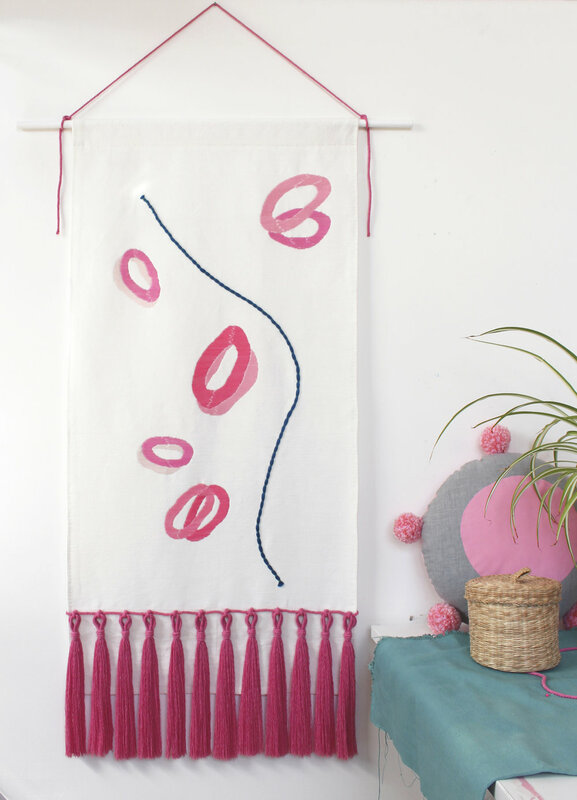 After studying Textiles and Embroidery at the London College of Fashion and graduating from Manchester Metropolitan University in 2009, Mariel founded Covet Interiors.The independent online homewears shop features Mariel’s one-of-a-kind textiles, ceramics and prints, instinctively made through experimentation and impulse - her creative spirit is at the heart of everything she does. 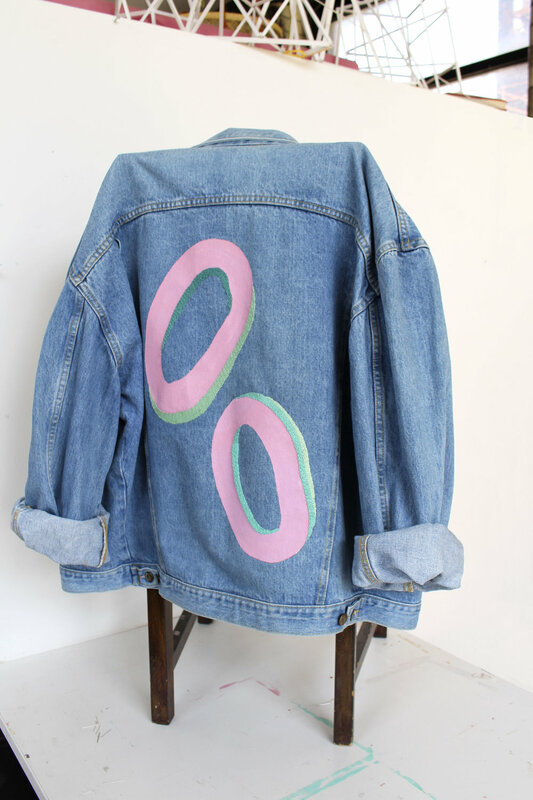 Led by an ethos that strives to work with environmentally friendly materials, Mariel’s pieces are as bold as they are colourful; distinctively fun and ethical. Her textured and sustainably minded prints work to inject a pop of colour into any room, while reflecting her own personality and surroundings, which she believes is instrumental in the her pieces going the distance. By mindfully ensuring her work minimizes risk and harm to the environment, Mariel’s bespoke, one-off pieces speak volumes of her depth and awareness as she tunes into the influences that surround her in her day-to-day life. Reflecting on Mariel’s career to date, which boasts clients such as Cloudwater, Bestival, and PINS, it is apparent that her ability to use such a wide variety of materials and objects, from laser-cut acrylic, to ceramics, and the humble needle and thread, has enabled Mariel to carve out a niche in what is increasingly becoming a highly saturated and competitive market. My job is constantly varied. Although Covet is my main baby, I do a lot of different things to pay the bills. This includes custom textiles commissions, prop making, prop styling, window displays, but I also work part time in a cafe too. This means my "job" is always moving, changing and pushing me in different creative ways. What does your working day entail? No day is ever the same for me, due to the nature of my projects, but I like to get up early and get going as soon as I can. I cycle to my studio at Islington Mill, which gets me active and moving and gears me up for the day. As I say, no day has a typical routine, but I do try to make a plan for my week ahead, and I also try to make a to do list for my next day, the evening before. That helps me to just crack on as soon as I get in, in the morning. Can you sum up Covet Interiors in one sentence? Unique handmade homeware full of texture and fun. What is one peak and one pit of your job? The ultimate peak is that I am my own boss. I have control over what I am doing, who I am working for, and how I work. The problem with that freedom, is that you can get lost in decisions and what to do next. You can't always be sure what opportunities are coming around the corner, or if they even are, which can be very scary. It's an impulse. I can't not create. I was taught to be creative from a very young age, and it's just totally inbuilt in me. Often if I get bogged down in admin or have time away from the studio, I can get very antsy, and I'll eventually realise that I haven't made anything for a while. I'm so hands on, I just NEED to do it. I'm also very curious and want to look at EVERYTHING (going on a walk with me somewhere new can be quite slow going, as I want to stop and examine every colour and texture). This helps keep my mind fresh and my eyes excited to create! How do you make sure your work stands out from the crowd? With my textiles work, i try very hard to make work that I really believe in. I feel strongly that the pieces that we surround ourselves with in our home should reflect our lives and our personalities, not just some trend that has no meaning and will pass. This means that I work instinctively with colour and texture to create textiles that I feel are distinctive but also full of love. What one object or tool could you not live without? Can you tell us how you came to working with textiles? My mum taught me so much when I was small. I remember doing batik with her at school. I always had little kits for embroidery and knitting too, and then as I got older, I thought I wanted to be a fashion designer, but when I did my foundation year at LCF I realised I was interested more in the surface of the fabric rather than how to construct with it. How do you ensure you stay true to your brand working across multiple design disciplines? This is a tricky one. I think it mainly comes down to the way that I use materials and techniques, and work with clients. I try hard not to be too influenced by other makers' styles, and work the way that I feel is instinctively right for me. I think that this gives my work a voice. Does your work lend itself to collaboration? Yes! I recently collaborated on a wall hanging with DR.ME that's currently hanging in The Beagle in Chorlton. As they work in collage, we had some fabric digitally printed and then we worked together to create a piece that we both really like! What advice would you give to young designers and makers starting out today? There's so much to say. But perseverance is key. You might think the work that you're making is good now, but keep on and keep on, as it's only going to get better! And don't give up! Do you have any upcoming collaborative projects in the pipeline? I do but it's a secret at the moment! What one thing would you like people to take away from your workshops? To be able to use stitch in a confident way, free from the rigid constraints that embroidery has a reputation for. How did you get to working in textiles, design and craft? As I said I did my foundation at the London college of fashion, and then I studied Embroidery at MMU. From there I've gone on to carve my own weird niche on the side of "normal" jobs. It's taken a long time and I'm still not at the level I want to be, but I'm getting there! Well my proudest achievement is actually that I am actually able to do what I do and get by! It can be hard to know where your next paid job might be coming from, so I'm genuinely surprised every time I get more work! Aside from that, I'm so pleased with the body of work that I created for Cloudwater for their S/S17 can labels. That project pushed me hard and I created some really interesting pieces that have helped me develop my style a lot. Do you believe in the elusive work-life balance? I try to live in a way that the two weave together and influence each other. This doesn't mean that I'm always on call for a client or project, but that everything that I do and experience influences my work or helps me make decisions about my work. Things like relaxing and listening to music, going for a skate, or being around my lovely friends can boost my work in ways I never imagined. So even though I need down time, I try to work and live in a way that can cause me less stress. This doesn't ALWAYS work. Sometimes a deadline can see me burning the candle at both ends, but after a period of this it's important to take some time to rebalance and look after yourself, and look at where you are going next. Who are you favourite designers and makers? Rachel Burke (imakestagram), Beci Orpin, Amy Marsh, Aliyah Hussain, Kirstie Maclaren, Anna Beam. What one thing do you need to kickstart your day? If you could do any job, what would it be? My job! But more of it!! Strong, emotional, loving. This works in all aspects of my life. Do you have a favourite quote that motivates you? Sunshine, sewing, skating, good food and friends. Where is favourite spot in Manchester? Anywhere high above the city where you can see everything going by. Reasons to stay alive by Matt Haig. Portrait of Mariel by India Hobson. 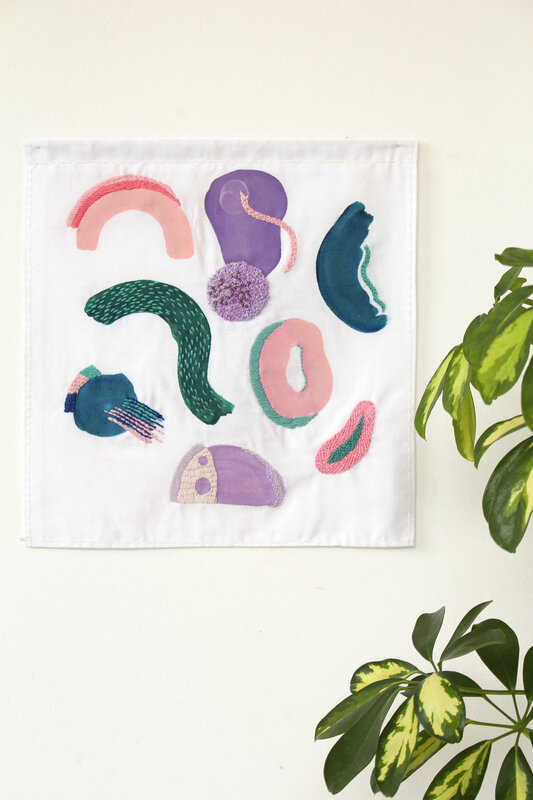 Another collaboration taking place in the not so distant future (next week to be exact) will see Marial hold court as she hosts her embroidery pattern workshop at Pot Kettle Black. Attendees will be taught a variety of stitches which they will be able to use to create an array of beautiful contemporary embroideries, with the theme of pattern. The workshop caters to all, from beginners, to expert stitchers, to those looking for some fresh inspiration, all attendees will be provided with materials, including some mega patterned source material, and you get to take home your own hoop and needles - what more could you ask for? You can check out Mariel’s designs on the Covet website, and meet the maker herself at our Wall Art Workshop next week. Tickets cost £30, and the event will run from 6pm to 7.30pm at Pot Kettle Black on Wednesday 25 July.